For some reason, this strikes me as looking amazingly modern. ALMOST human is “SHE,” work of Courtenay Pollock, well known sculptor of London. 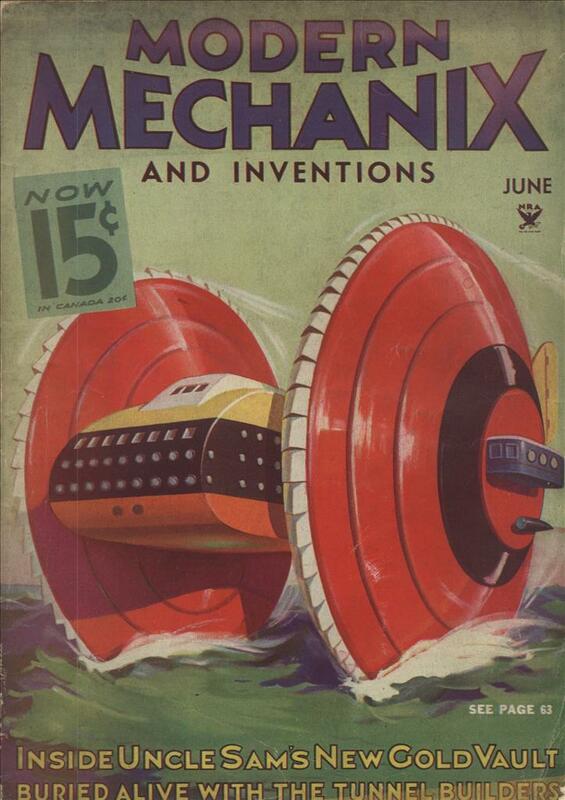 With the aid of a small electric motor, “SHE” is smiling, coy, demure, or scornful as her master wills. Rolling her eyes about in an enchanting manner, she even displays a lovely set of dimples. This “living” model is on display in one of the leading department stores of London. A cordon of police are required to keep the crowd moving and traffic clear in the streets. The skull is made up of hinged sections, each of which are controlled separately through levers and switches. Gears and levers connect each part to the driving motor. 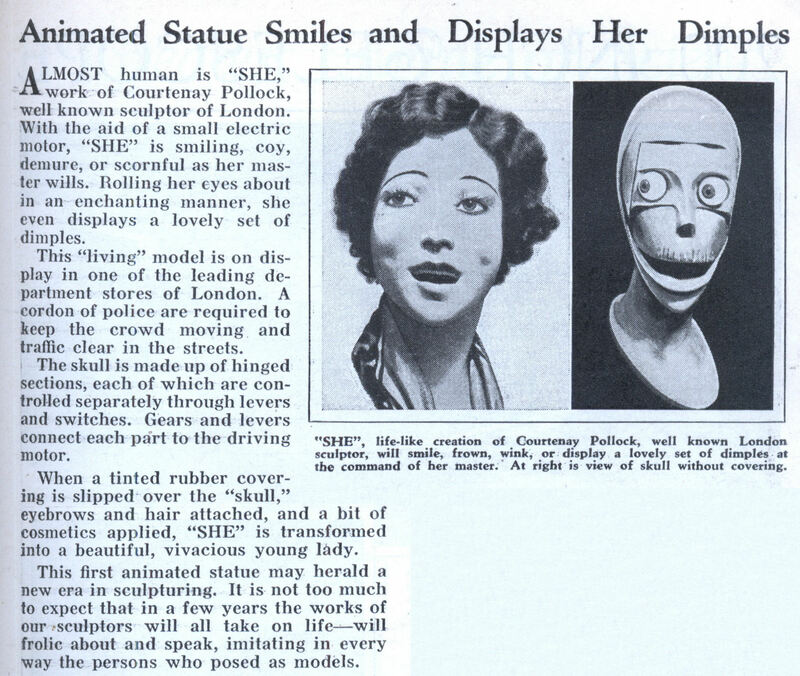 When a tinted rubber covering is slipped over the “skull,” eyebrows and hair attached, and a bit of cosmetics applied, “SHE” is transformed into a beautiful, vivacious young lady. This first animated statue may herald a new era in sculpturing. It is not too much to expect that in a few years the works of our sculptors will all take on lifeâ€”will frolic about and speak, imitating in every way the persons who posed as models. I agree…it’s quite cool, especially for something done almost 75 years ago. Isn’t that Bender’s girlfriend, Angelyne? This looks an awful lot like the Kismet project.. I was so intrigued to find this. Courtenay Pollock was my grandfather. After this model, there was one that could smoke cigarettes ! The man who had invented the rubber material for the skin died quite suddeenly and th epropject went no furhter. The remains of the “mobile head” are with a cousin of mine. Thank you John, for providing that extra info about my grandfather. Courtenay Pollock certainly created a wide variety of amusing and novel mechanical artwork. That is beside the more traditional bronze and plaster busts, drawings and paintings. Then, was it not he that started the Pollock Toy Museum in London? My father, Nicholas Pollock, certainly inherited a few of these artistic bents. Finding some degree of solace through painting following the demise of his wife, he devoted the last decade and more of his life filling his house and giving away a small collection of still life paintings and landscapes despite his fading eyesight. His painting of the renowned Bodhi tree where the Buddha attained his deep wisdom still remains a treasured feature in my living room.